M-payments offer very little benefit to consumers or merchants today. Uptake, even for the widely hyped ApplePay, is disappointing. Meanwhile, retailers, their customers saturated with loyalty cards and engagement falling, see mobile apps as a big opportunity and m-payments as an escape from onerous card fees. They are likely to be disappointed – it has become very difficult to drive app downloads and engagement. Moreover, ApplePay and AndroidPay will be default platform utilities with privileged access to consumers and serious working advantages over 3rd party solutions. MCX’s CurrentC payments product, unaligned with AAPL or GOOG, will be limited to a clumsy multi-step QR code approach as a result. Ultimately, we believe that the success of m-payments will come as they are integrated into a broader re-imagining of the consumer m-commerce experience as a frictionless piece of iOS and Android. In this, GOOG will take a much more active role, facilitating successful loyalty solutions, enhancing merchant reach, engagement and targeting, and tracking ad effectiveness through to purchase. AAPL is tightly focused on providing value for – and regulating access to – its loyal and lucrative customer base. The ongoing internet usage shift toward mobile platforms will further strengthen the importance of iOS/Android, to the detriment of m-commerce and payments solutions that choose to compete independently. M-Payments are just a piece of M-commerce. Alone, M-payments offer little to consumers or merchants. Just 15% of eligible iPhone owners have registered for the well-hyped ApplePay and only half of those have become regular users. Why? 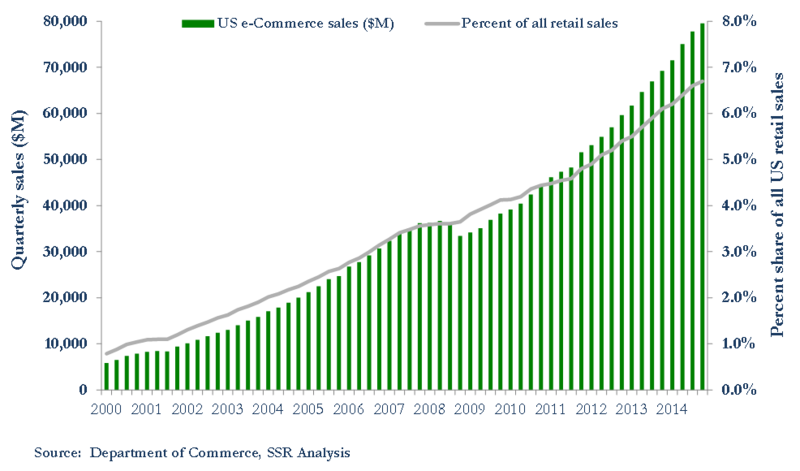 Consumers are happy with credit cards and see no value from changing, particularly given spotty support by merchants. M-Payments have been successful only in narrow circumstances where they have been integrated into an improved customer experience – e.g. Starbucks and Uber. Merchants lack reach, engagement and user data. Loyalty programs have been an enormous boon for several pioneers – Amazon, Target, Walgreens, etc. However, as programs multiply, card fatigue has driven consumer engagement down. Merchants are now looking to mobile, but major obstacles loom. Their data on customers is limited – name, email, address, phone number and their purchasing record with that specific retailer. Merchants lack the wherewithal to find their customers outside the store, much less to engage them. SBUX is the exception, not the rule. SBUX successful mobile app was early to market, addressed a pain point for customers (waiting in line), and leveraged unusually high visit frequency by a tech savvy, young customer base. While there may be analogs to SBUX, particularly amongst other fast casual restaurants, the large majority of retail merchants cannot pitch significant experience benefits to their customers and will rely on loyalty discounts entirely analogous to their existing card-based programs. Mobile apps are no panacea. The average smartphone user opens just 26 apps in a given months, including default apps like search, maps, calendar and messaging. Only 1/3rd of users download even a single app in any month, and 80% of downloaded apps are used once and discarded. App notifications have become the new spam, and both AAPL and GOOG are adding tools to help filter them. Moreover, the platform owners place restrictions on apps – MCX’s CurrentC payments solution will not be allowed to use NFC on iPhones, and will rely, instead, on a clumsy multistep checkout using QR codes downloaded to a store app on the customer’s phone. AAPL and GOOG are essential for m-commerce. Merchants, advertisers, and 3rd party payments platforms cannot access mobile consumers without going through GOOG and AAPL. With the power to set default apps, proprietary access to user data, and control over 3rd party apps (distribution, notifications, in-app purchases, etc. ), the platform owners can give technical advantages to their preferred solutions and stymie alternatives. We note that m-payment rules set by V and MA will block platforms from taking transaction fees or collecting transaction data in the future, blunting direct value capture by AAPL and GOOG, but expect that a “device present” rate comparable to “card present” is forthcoming, giving the platforms a significant cost advantage for payments made from mobile devices. AAPL is content to play gatekeeper. AAPL’s device centered strategy relies on maintaining strict control of the user experience, weaving differentiated functionality into integrated hardware and software solutions. As such, it has banned alternative payment solutions from using the radios or the biometric authentication on its devices, relegating 3rd parties, like MCX, to web-based solutions. Meanwhile, ApplePay is required for in-app purchases and will likely be integrated into the Safari browser as well. We believe that the 15bp fee negotiated with banks will sunset, and that the primary benefit of m-commerce to AAPL will be in further cementing customer loyalty, and charging merchants fees for adding loyalty programs to ApplePay. GOOG wants to orchestrate m-commerce. GOOG hopes to partner with merchants and brands to drive m-commerce forward. Loyalty programs can be greatly enhanced with GOOG’s ability to authenticate customer identity, provide deep, actionable interest and behavioral data, and target high potential would-be members. At the same time, linking with merchants would give GOOG means to track advertising all of the way to purchase. Moreover, GOOG means to provide further support to brick-and-mortar merchants on line – one-click shopping, contextual push advertising tied to time, location and activity, even same day delivery service. With 4,000 Googlers tasked with selling merchants and helping them implement solutions, we see GOOG as a force in the future of m-commerce. Concerned for PayPal. The strength of AAPL and GOOG is a considerable threat to PayPal’s bread-and-butter on-line payments business as internet usage continues its shift to mobile platforms, particularly if the two platforms are granted advantageous “device present” rates. We are more bullish on the potential for the EBAY parent, particularly as an M&A target for companies, such as BABA and GOOG, looking to gain scale in e-commerce. M-commerce transition good for web-scale players. Amazon is well positioned for m-commerce with its outstanding cost, reach and engagement. FB, TWTR and Pinterest are looking to implement one-click “buy” buttons – we believe these will gain good traction with time. We also see upside for web companies, like GRUB and PCLN’s OpenTable, which facilitate m-commerce for merchants. On their own, mobile payments add no value. Consumers don’t see the point, and merchants haven’t rushed to support them. So far, ApplePay has been a bust, following in the footsteps of Google wallet and other notable failures. Still we think m-payments will be a big deal, eventually, but only as a part of a broader re-imagining of the shopping experience through mobile. We have working examples of this – Starbucks’ app cuts down your waiting time and makes sure the barista gets your order right, Uber lets you get a car when you need it and hop out without having to settle with the driver. Mobile payments are along for the ride. But these are the exceptions, not the rules. Most merchants are NOT prepared for the mobile commerce era. Retailers got religion about loyalty programs just as consumers grew tired of their unwieldy collections of merchant cards. Yes, program membership is up, but active usage is falling fast. Truth is, most retailers have little information about their best customers – they have a name, an email address, maybe a telephone number, and a record of the purchases made in their stores and on their websites. They don’t have the petabytes of predictive demographic, interest and behavior data that is amassed by Google and Facebook. Most merchants don’t even have the data processing capability needed to really make use of the data they have. Critically, they can’t reach consumers outside of their stores and have very little real engagement with them either. Mobile apps will NOT fix this. Smartphones are more crowded than wallets. It is very, very difficult to get consumers to download an app and even more difficult to get them to use it – 80% of downloaded are used just once and discarded. Typical smartphone users access just 26 apps a month, and more than half of those are default apps. App notifications are the new spam and consumers are using OS tools to block all but the most valuable messages. Merchants will also live under AAPL and GOOG’s rules. ApplePay and AndroidPay will be default apps, automatically loaded on devices and tightly integrated to the native operations of the platform, including secure biometric authentication and the wireless connections used for transactions. These OS-based payments mechanisms may also be granted “device present” rates nearly equivalent to “card present” rates and a significant leg up vs. 3rd party alternatives for in-store, in-app and on-line transactions. AAPL’s rules are particularly restrictive, denying 3rd party access to iPhone radios and Touch ID, for example, limiting the MCX consortium’s CurrentC payments product to a clumsy, multistep, QR download approach that is far more cumbersome than a card swipe. We believe that merchants will have little choice but to involve AAPL and GOOG. The platforms can reach customers and engage them on the behalf of retail partners. The platforms, particularly GOOG, have rich data sets and tools to help retailers address the real needs of their existing loyal customers AND find new ones as well. The platforms can deliver value by matching interested buyers to merchants, while confirming sales back to brand advertisers. Of the two, GOOG is best positioned to benefit. It can greatly enhance loyalty programs with its data, analytics, consumer reach and engagement. It can provide services to merchants (shopping, delivery, etc.) and advertisers. All of this can be monetized without transaction fees or controlling transaction data. On contrast, AAPL is content to be a gatekeeper. As such, the revenue upside is unlikely to move the needle that much, but it won’t hurt. 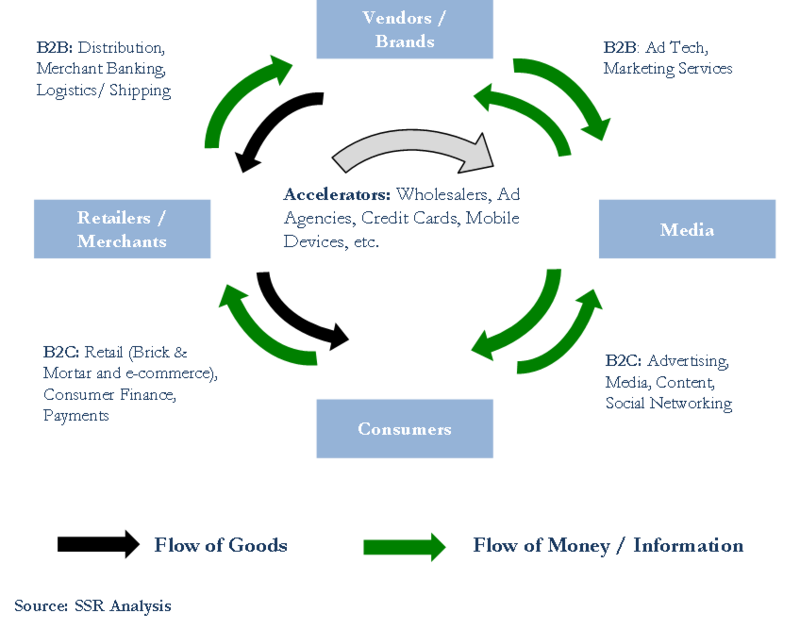 Business-to-consumer commerce is an age-old process built on the flow of information to consumers from product brands and retail merchants as to the virtues and availability of products, and the flow of money from consumers to merchants to brands as they visit stores and walk away with purchases. Modern economies evolved with businesses that served to stimulate and accelerate the cycle and to make it more efficient – e.g. wholesale distribution to streamline inventory, new media and ad agencies to reach more consumers with more effective messages, and credit cards to make the act of purchasing more convenient (Exhibit 1). E-commerce began to change things, disintermediating long standing retail categories and bringing the demise of well-known retail brands, like Tower Records, Circuit City, and Borders Books. Still, despite making painful inroads, e-commerce tops 25% of total purchasing in only a couple of categories, remaining below 10% for most categories. The next step is mobile commerce. Smartphones now are ubiquitous and essential to the daily lives of consumers, and, increasingly, a tool for commerce. Mobile commerce, or m-commerce, has the potential not just to make online spending more convenient, but to bridge the gap between classic desktop e-commerce and the brick-and-mortar stores that still make up 93% of purchases. Still, the initial wave of m-commerce functionality is a bit “meh”. Mobile payments are currently isolated to merely replacing the swipe of a card at a point of sale terminal – hardly game-changing, and if the majority of physical stores don’t support it, hardly convenient. Apple is eager to share the statistics on the number of credit cards that have been loaded to Apple Pay, but considerably less eager to share the meager number of users actively shopping with the service. Retail loyalty programs are legion, but very few shoppers have bothered to download the apps, much less to use them. Mobile advertising is hot, but brands are still buying on faith as no one is able to complete the circle from targeting, to impression, to confirmed sale. We believe that the promise of m-commerce will only be realized as roles around the entire cycle evolve with explicit cooperation from step to step. Mobile payments need to enable innovation in retail stores and online. Loyalty programs need to reach outside the store to find new customers and influence them to visit and buy, both in person and online. Advertising needs to reach the right people, at the best possible moment, and to confirm that the messages are leading to actual sales. All of this needs to be done in ways that clearly improve the experience of shopping and buying for consumers. Meanwhile, brick-and-mortar merchants are looking to fight back. Rather than railing about “Showrooming” and positioning their own on-line shopping sites head to head against the likes of Amazon, they are looking to incorporate mobile devices as part of an “omni-channel” approach that would engage users across in-store and on-line venues and build on customer loyalty. This dovetails with a pell-mell rush over the past five years to sign customers into loyalty programs. Early success stories, like Target, where 20% of sales are made through its RedCard loyalty program, has prompted imitators. 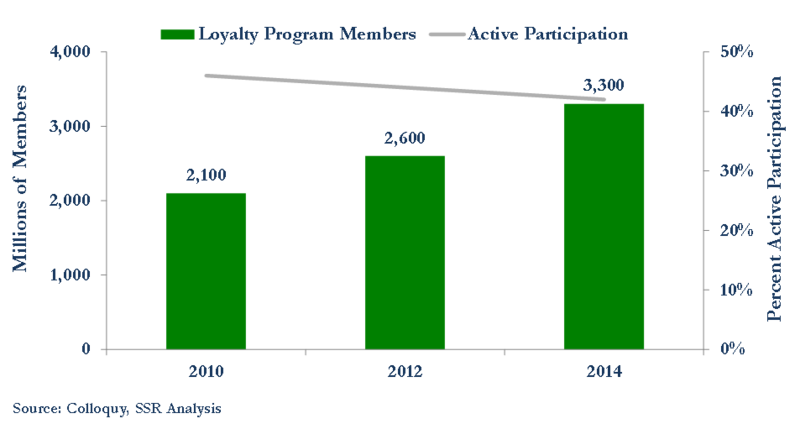 Total US retail loyalty program memberships have risen more than 50%, but active participation in those programs has begun to slide (Exhibit 2), as consumers have begun to experience wallet fatigue from the cards and coupons that they are expected to carry. Merchants have now turned their attention to mobile apps, wowed by the huge success of Starbucks. Members of the My Starbucks Rewards (MSR) program are growing their spending at a 50% annual pace, with mobile app transactions now accounting for 18% of sales at Starbucks stores. Of course, Starbucks had some key advantages. First, it offered an app that addressed customer pain points – users of the MSR app had shorter wait times and greater order accuracy, while earning rewards. Second, Starbucks enjoys extraordinary visit frequency from its best customers, many of them returning daily for their coffee fix – this encourages them to keep the app handy. Third, Starbucks was early, introducing its mobile app in 2009 in 16 stores, expanding nationally in 2010 and hitting 42 million transactions by the end of 2011. Finally, Starbucks has committed the resources to build a world class IT organization, able to conceive and implement this pioneering system. Very few retailers are even in the same time zone as Starbucks. It has become VERY difficult to get the attention of consumers with an app (Exhibit 3). Unlike the good old days when MSR was launched, smartphones are now jam packed with apps. In a typical month, just a third of smartphone owners bother to download even a single app. 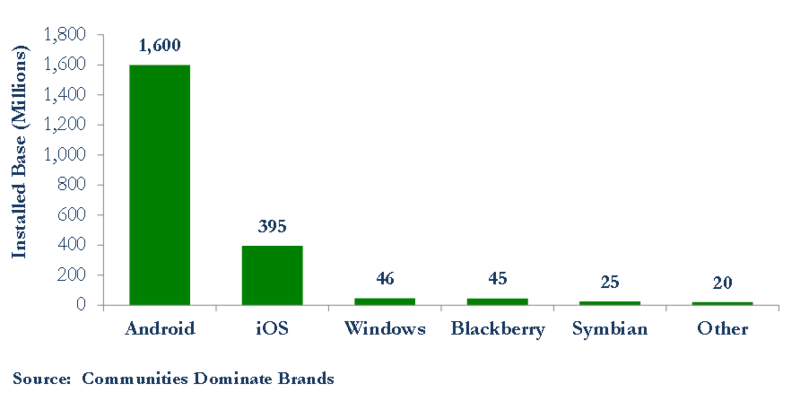 Of the apps that are downloaded, 80% of them are used just once or not used at all. In that typical month, the average user will open just 26 apps, of which more than half are default apps, like search, maps, calendar, email, messaging, or the app store. Even if a merchant can get an app on a customer’s phone and even if that customer uses that app on visits to the merchant’s store, odds are that the customer will block push notifications from the app. App notifications are the new spam. 3rd party apps also live under the rules established by Apple and Google, whose platforms run nearly 97% of all smartphones in the US (Exhibit 4). These companies have built a lengthy roster of default apps integrated into their operating systems and pre-loaded on every device. These apps get launched automatically in context and have privileged access to hardware and software functions. Apple takes this a step further than Google, blocking its customers from replacing default apps with 3rd party alternatives. For m-payments, 3rd party solutions do not have access to either Touch ID, Apple’s secure ID solution, or to the NFC and Bluetooth LE radios necessary to wirelessly communicate to point of sale terminals. These are huge advantages for ApplePay and AndroidPay. The CurrentC mobile payments solution being developed by the big MCX consortium of US retailers cannot use NFC connections and its member apps won’t automatically load at checkout. Customers must download and register each merchant app, launch the app in the store, receive a downloaded QR code at checkout, then provide that code to the clerk to scan. From a convenience standpoint, this is a serious step down from simply swiping a credit card and signing. For m-commerce purchase made from an app, MCX members are out of luck – they will have to use ApplePay. Google is a bit more liberal on all of this, but with iPhones in the pockets of 42% of US smartphone users, with a disproportionate skew toward big spenders, the elephant in the CurrentC war room is huge and Apple shaped. We also believe that the superior biometric authentication possible on mobile devices with integrated m-payments utilities will be recognized by Visa and Mastercard with “Device Present” credit fees in line with the “card present” fees paid on traditional cards today. With the platform holders monopolizing access to the biometric fingerprint scanners and secure elements of the device, this gives them a further advantage over 3rd party m-payments solutions, which may continue to suffer under higher, “card not present” rates. This could be particularly valuable to Apple and Google as applied to in-app and in-browser e-commerce transactions, which have traditionally seen only “card not present” rates (Exhibit 5). We believe that merchants will soon reach the inevitable conclusion that refusing to work with either Apple or Google on m-commerce solutions is self-defeating. AndroidPay and ApplePay are both in the process of launching integrated support for merchant loyalty programs, automatically launching at checkout, applying all relevant deals, discounts, coupons, to the transaction, and crediting it to the loyalty program, while executing the payment. Google is trialing a hands free m-payments capability that can execute transactions without the customer needing to fetch their phone – a picture on the POS terminal and a verbal agreement is enough to authenticate a purchase as long as the phone is somewhere in range. Apple has been active promoting beacons for geo-fencing that would allow similar functionality, and can point to its own Apple Stores for examples on how it can change the shopping experience. With the help of the platform owners, retailers will reach and engage customers far more easily than they could on their own. Google, in particular, can match loyalty program lists to its own, much deeper consumer profiles, aiding merchants in identifying the real interests of their best customers, and engaging successfully with them, perhaps also finding new high potential customers to target. Google can communicate with those customers, presenting contextually appropriate ads through Google Now or connecting to “showrooming” consumers through its new Now on Tap capability. The rules for m-commerce set by Visa’s VDEP and MasterCard’s equivalent program exclude mobile payments solutions, such as AndroidPay (and ApplePay, once its previously negotiated deals roll over), from charging a transaction fee or from capturing transaction data. All banks participating with Visa (or MasterCard) are free to join, and all locations accepting Visa or MasterCard that support NFC payments automatically support the m-payment solutions that agree to the rules. This answers two of the biggest merchant concerns around platform integrated mobile payments – Google will not be charging an added fee and it will not be using purchase data to target customers for rival merchants. Of course, all of this does serve to perpetuate the role of card issuing banks and the resentment of merchants toward their transaction fees. However, as biometrically authenticated mobile platform payment solutions obviate much of the fraud risk currently borne by the banks, it may be that the rise of m-payments will be a harbinger for much lower credit fees down the line. Google has a lot to offer merchants. It can match up loyalty program profiles with its petabytes of consumer data and provide retailers with real insights about their best customers that go far, far beyond what they bought at one store last year. It can reach customers and engage them outside of the store via Search, Maps, Google Now, Now on Tap, and its other applications, reaching not just to Android users but to Google App users on iOS as well. It is building a set of services that it can offer merchants to improve their on-line presence, from shopping ads with one-click buy buttons to same day deliveries in many markets. It has 4,000 sales and support representatives calling on merchants and helping them use Google services to rethink their customer experiences. McDonalds and Papa Johns are testing the hands free implementation of Android Pay for their drive-throughs. Jamba Juice is working with Google on its order ahead solution. If enough merchants co-operate, Google can begin to track the effectiveness of its ads straight through to purchase. This has been the Holy Grail for digital ads, but until now, the data necessary to do it has been jealously guarded at each step. This could be very valuable to advertisers, and, to Google. Apple is less ambitious about working with merchants to push m-commerce. It doesn’t have petabytes of consumer data, and even if it did, it wouldn’t be interested in sharing it with retailers. Apple fronts for the most attractive segment of smartphone users, cosseting them with its integrated hardware-software magic and watching the door to keep the riffraff out. Banks and merchants will just have to play by Apple’s rules if they want to play with its customers. Merchants who cooperate with Apple will get to put their loyalty programs in the Apple Wallet so that the merchant app loads and all appropriate deals are applied automatically. Merchants who don’t cooperate with Apple are blocked from using radio based m-payments, full stop. Initially, banks had to pay 15bp to play with Apple – take it or leave it. Visa and MasterCard, responded to Apple’s power play with their own, setting rules that will make it hard for Apple to sustain those 15bp in the future. No matter, it is very likely that Apple will charge merchants handsomely for putting their loyalty apps in the wallet. Merchants will grumble, but we suspect that most of them will pay the cover charge and come in. Of course, none of this is likely to generate the kind of revenues needed to move the needle for Apple. Still, it will be one more thing keeping those well-heeled customers happy. That’s not a bad thing. Amazon has its own user data and its own extremely successful loyalty program, along with low costs and the world’s best logistics. It will do just fine in the m-commerce era. Facebook, Twitter and Pinterest are, like Google, looking to add one-click buy buttons to their popular services. We think this will take some time to get traction, and will probably need to work with ApplePay and AndroidPay, but m-commerce could be a nice capability for all three. The trend to m-commerce should also be a boon to established app companies, like GrubHub and Priceline’s OpenTable, that help brick and mortar companies reach customers on-line. As for Ebay and PayPal, our take is different than our Financials and Consumer analsyts – We are concerned that PayPal’s franchise for on-line and in-app transactions could be eroded by platform integrated payments solutions, particularly if we’re right about a “device present” rate. Meanwhile, we suspect the parent EBay, with its merchant friendly e-commerce marketplace, will be an attractive acquisition target for the likes of Alibaba or Google.